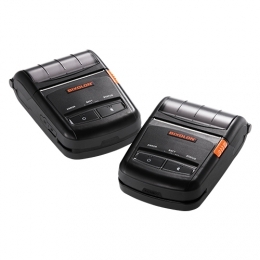 The Bixolon SPP-R210 is currently one of the most compact mobile receipt printers available, at a fantastic value for the money. With its light weight of only 232g including battery and magnetic stripe reader and compact size LxWxH 79 x 116 x 37 mm, it is the perfect companion for mobile operation in the field and hospitality. Communication with the host occurs either corded USB, RS232 or completely wirelessly via Bluetooth 3.0, or Wi-Fi 802.11 b/g, respectively. The Bixolon SPP-R210 is currently one of the most compact mobile receipt printers available, at a fantastic value for the money. With its light weight of only 232g including battery and magnetic stripe reader and compact size LxWxH 79 x 116 x 37 mm, it is the perfect companion for mobile operation in the field and hospitality. Communication with the host occurs either corded USB, RS232 or completely wirelessly via Bluetooth 3.0, or Wi-Fi 802.11 b/g, respectively. With 8 dots/mm 203 dpi the robust mobile printer prints 58 mm wide receipts in no time at all a print speed of 90 mm per second significantly reduces waiting times. Cross-platform operation is no challenge for the SPP-R210 thanks to MFi and SDK for iOS, as well as Android, you connect the mobile printer with nearly any tablet or smartphone. Drivers for Windows, OPOS, JPOS and Linux are available for downloading at any time. Included in the delivery are the battery, battery charger, power cord, belt clip and a CD with all the installation and configuration tools. A 24-month warranty additionally secures your investment.